To fly in paramotor is used a paraglider like wing and the motor is a propulsion that will help us to take off from any plain and clear ground. With the paramotor we have managed to have a small plane in our own house, we just worked early and in 15 minutes we are in a nearby open field prepared to take off. The freedom and comfort of this mode of flight is what has made more and more pilots find occasional plowing our skies with this curious flying artifact. This is not to say that the paramotor is exempt of risks like any other aerial activity, it is necessary to make sure to fly successfully for a long time starting the learning under the tutelage of a specialized school. Paramotor flights at sunrise or sunset on any of our beaches or countryside are an incredible experience for our senses. Set of norms, theories, and equipment for good practice. -	DURATION: 8 Days approximately. Continue or in parts. -	Basic theory of aerodynamics and piloting. -	Flight equipment and material. -	Inflation Practices and Ground Wing Control. -	Non-motorized flight practices for take-offs, turns, gliding flights and landing maneuvers. Or flight with instructor in Trike two-seater. 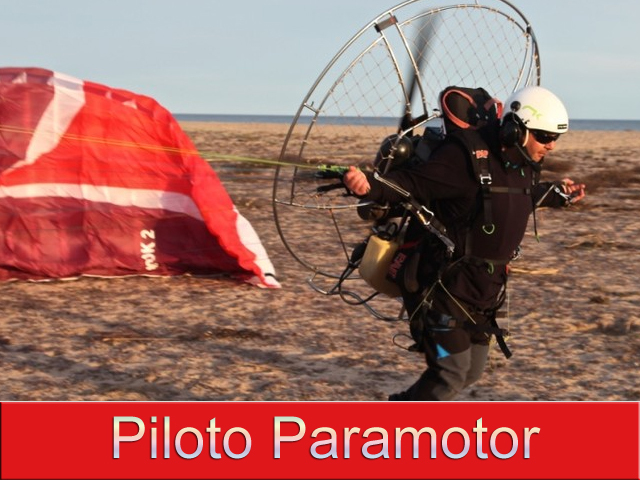 -	Basic theory about flight in paramotor. -	Mounting, starting and pushing practices with the engine on the ground. -	Take-off maneuvers and field flights. -	Price: 850 € (All material included). -	Method of payment: € 450 at the beginning of the course, the rest on the day we start with the flights.